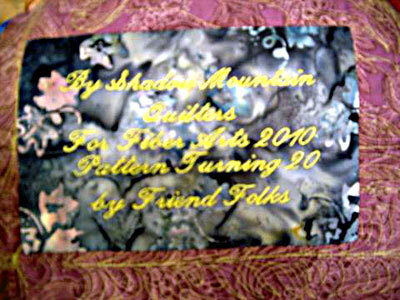 Here are the pictures of the Turning 20 that my quilt circle, Shadow Mountain Quilters in Pahrump, Nv, made per your permission that you gave me a few months ago. 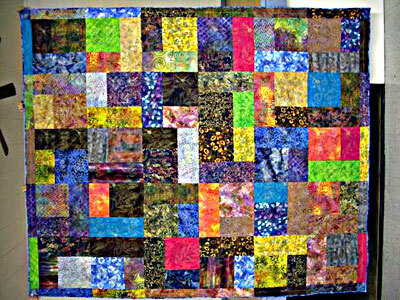 As you can see, the quilt turned out beautiful, made with all batik fat quarters donated by the circle members. Additionally, I have sent you a picture of the label that is on the back of the quilt. We have been selling tickets for about a month now and the sales are slow, probably due to the economic times. Our quilt show is in April, so we are hoping for a good result in the ticket sales by then. Thank you again for permission to use the Turning 20 pattern for our Opportunity Quilt for 2010.